This is the most popular and economical type of connector that has is used in the UK power required by a caravan or trailer for indicators, brake, fog & sidelights. 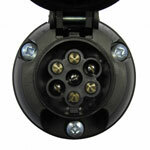 This is a socket on the vehicle and a plug on the caravan or trailer. It is used for all standard towing requirements and can be used with lighting boards, cycle carriers, caravans, garden trailers, car trailers & horse boxes. The extra power required by a caravans reversing lights, interior lights, battery charger & fridge are provided by a 12S connector. This is fitted as a socket on the vehicle & a plug on the caravan or trailer. The permanent supply provides power to the interior lights when the engine is turned off and is switched to charge the caravan battery when the engine is running. The switched power supply provides power to the caravan fridge when the engine is running. 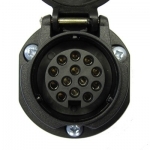 A 12S socket can also be used for horse boxes with internal batteries and tipper trailers with electric lifts. Certain vehicles or caravans may come equipped with one single connector that incorporates both the 12N & 12S functions, this is a called a 13pin or continental type connector. All caravans manufactured for the 2009 season onwards have the ISO 13 pin connector as a standard fitment. It is no secret that a tow bar is one of the most functional portions of any vehicle. These items enable anyone to transport goods from place to place with ease and safety. Pro-fit Towbars Limited is pleased to offer complete installation packages that can accommodate nearly any type of vehicle on the motorway today. Providing such options as mobile platforms and proactive client engagement, customers can remain confident in the fact that all of our tow bars are serviced by only the most trained professionals in the industry. Still, another factor that must be considered is the realm of towbar wiring services. What does this area involve and why is it so important? Let us take a closer look. A tow bar is much more than a means of efficient transport. 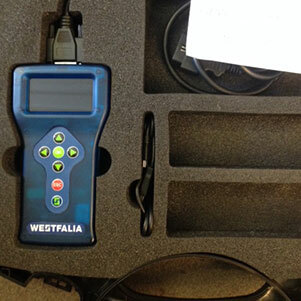 Its installation and subsequent use will have a profound effect on the vehicle in question. Not only must it be mounted correctly, but areas such as suspension, anti-lock braking systems, traction and stability also need to be taken into account. In this case, the correct wiring may prove difficult for those who are not entirely familiar with the requirements. Pro-Fit Towbars are specialists in this field and as our technicians are constantly trained in regards to the latest technologies, safety is never compromised. Numerous concerns must be addressed. 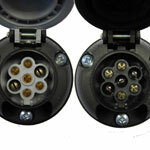 For example, different electrical connectors will likewise be required for different makes and models of vehicles. More robust tow bars may need extra wiring to accommodate for increased loads. These are but two of the issues that we take quite seriously. Also, we should never forget that the security of other drivers needs to be taken into consideration. So, it is essential that the vehicle owner is made aware of events as a stability issue or if a trailer light is not functioning properly. Pro-Fit Towbars appreciates that the proper wiring of any vehicle cannot be taken lightly and therefore, we are uncompromising in our attention to detail. For customers who are planning an upcoming trip or wish to move items from one location to another, the proper wiring needs to be taken quite seriously. So, we are very pleased to be able to offer bespoke and professional wiring services to a growing number of customers. Striving to achieve continuous quality assurance, Pro-Fit Towbars is simply one of the best in the industry.